Funny word “average”. It can be seen in some applications as almost derogatory or just plain insulting if it’s used with the right inflexion. But it’s a word motorcycle manufacturers have to live with on a daily basis, although not in the context of the quality of the product they produce. It’s what they have to take into account when deciding on the ergonomics of a given motorcycle, as the human body comes in such a diverse range of shapes and sizes. Ultimately these decisions are usually a compromise based on the dimensions of the “average” human. 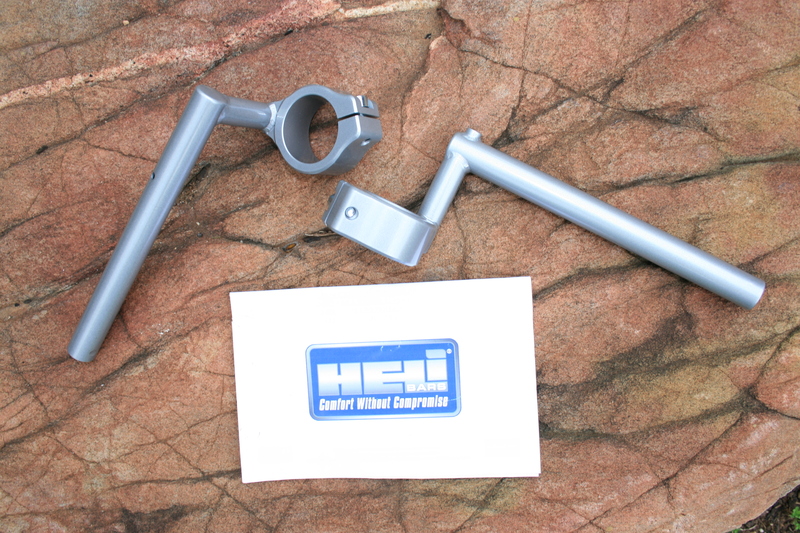 Enter American accessory handlebar manufacturer Heli Bars. With a slogan like “comfort without compromise,” they engender hope to those of us perhaps at the wrong end of the “average” spectrum. I purchased a pair for my Suzuki SV1000s from the local importer, Mick Hone motorcycles, via their website ( www.mickhone.com.au) for the reasonable sum of $350.00c including express postage. Fitting them was a straightforward procedure using the company’s instructions, although to retain the manufacturer’s warranty fitting by a qualified mechanic is required. The only special tool needed was a torque wrench for the head stem nut and handlebar pinch bolts. 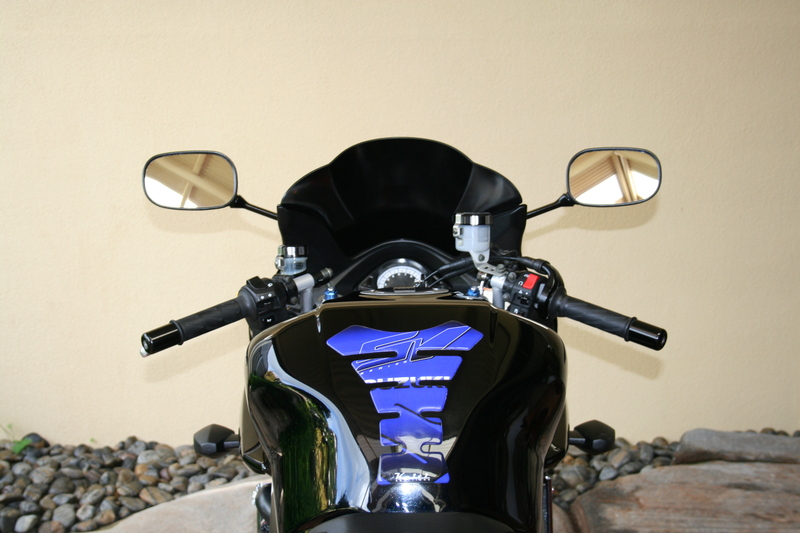 Most of the bars Heli make utilise the stock brake, clutch and throttle lines, which was the case with my SV1000s. The end result lifted the bars by just over 5cm and reduced the “reach” by a maximum of 2.54cm. This doesn’t seem like much but the difference is quite noticeable with less pressure on the wrists and lower back and even modulating the throttle seems a little easier. I didn’t weigh the stock handlebars, but the Heli Bars are heavier and appear to dampen engine vibration better. If there is a down side, I did notice a slight loss of “feel” from the front wheel, but the benefits of the Heli Bars far outweigh my sensitivity in adjusting to them. Long rides without the discomfort of the stock bars, in my opinion, make them a worthwhile investment. 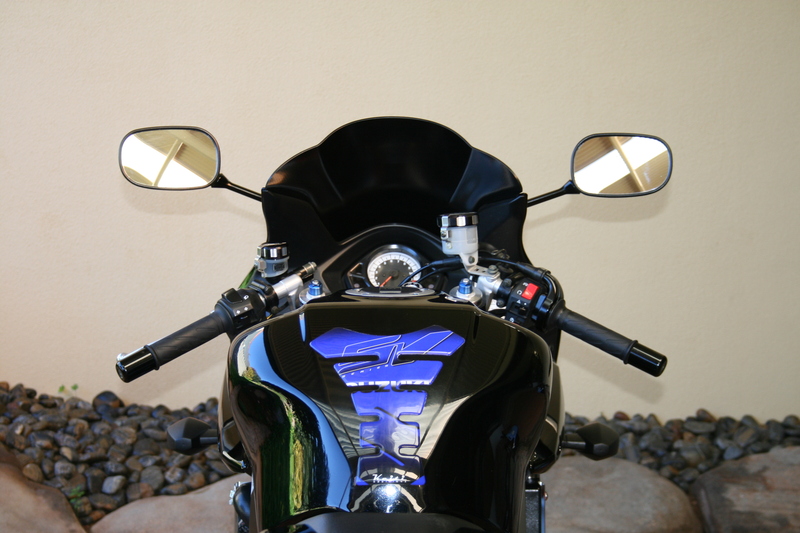 Heli makes a range of replacement handlebars for most popular motorcycles from a wide variety of manufacturers. This entry was posted in Product Evaluation and tagged Heli Bars on 22/11/2013 by Geoff Dawes.